The memorial to 18 soldiers killed in an IRA ambush at Narrow Water in Warrenpoint has been vandalised again just days after a previous attack. Wreaths were damaged and thrown on to the road in this latest incident, which police are again treating as a hate crime. PSNI Inspector Ryan Moore said: “We received a report around 7.30am this morning that wreaths had been damaged and thrown onto the road. It is believed that this happened sometime overnight. “This is the second time this week that damage at the site has been reported to police. On Thursday, October 4, crosses were broken and wreaths scattered at the memorial on the main Warrenpoint to Newry road. “And last month, damage was reported to us after an incident there on Saturday evening, September 15. “All these reports are being treated as hate crimes. “We would urge anyone who witnessed what happened last night – or either of the previous incidents – to get in touch with police. 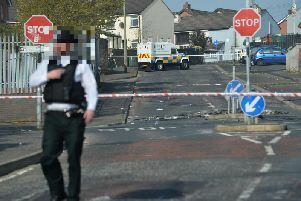 Alliance Councillor Andrew McMurray has appealed to those behind the attacks to stop. “This vandalism is achieving nothing except causing hurt and suffering to the loved ones of the deceased,” said Councillor McMurray. “After the last attack, I said it was a despicable act and I reiterate that. I am appealing directly to those behind these now continuous destruction to stop. Your actions have no support in the wider community.